EduFlicks ‘Hollywood Classroom Project’, working closely with Hollywood action director David Lane and film/ fx producer Michele Fabian Jones we were tasked with the role of design, conceptualisation and visualisation of an educational app for use by secondary education students. We were given a simple storyboard which we developed and re-designed resulting in a learning concept app that uses work groups/ smart phones and social media platforms to engage students with creative film challenges orientated around curriculum based subject matter, rather like a ‘digital exercise book’. 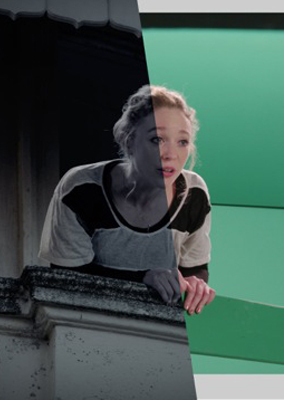 We also worked on green screen compositing work for the pre-loaded content, the example being the balcony scene from Shakespeare’s ‘Romeo and Juliet’. The app is currently in further development based on our supplied user journey examples, design and compositing.